Sire Corland has proven, by his own performance, and with that of his progeny, to be a treasure for the breeding community. He had a successful international career with Wout Jan van der Schans. 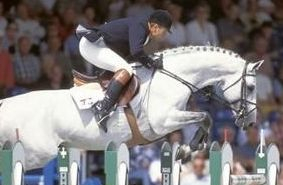 He has a jumping index with the KWPN of 143. Dam Azemieka VDL is by the famous Darco. She just missed her ster predicate scoring EX 65/G 70/SPR 75 at her keuring. 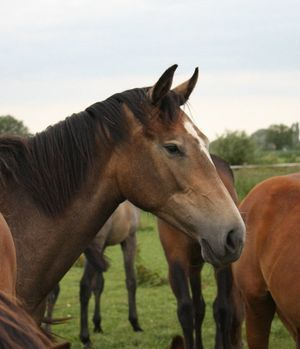 However, she comes from a very strong mareline, fokfamilie 452. "Ella" is the first foal to be born under the Mikali Farms breeding program. She will remain in Europe to grow and develop. Even at such a young age, the plan is to let her stay in Holland in order to present her at her studbook inspection as a 3yo, bred her for the first of our second generation (most likely to Cardento) and then get her undersaddle and to her IBOP. Here she is, in the photo below, just prior to weaning. Ella is developing into a strikingly elegant filly. 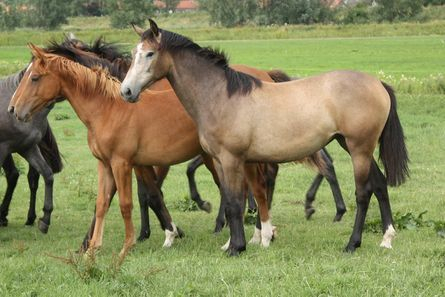 Even as a yearling, she has great conformation and balance to her movement - causing her to stand out amongst her field mates. 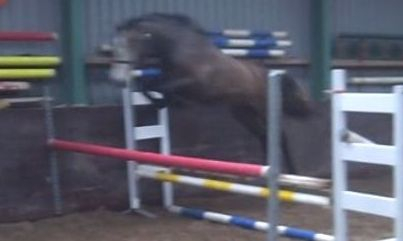 The photo below was pulled from a video during her 2nd experience with free jumping on March 31, 2011. Ella will be prepared and presented for her studbook inspection this summer. 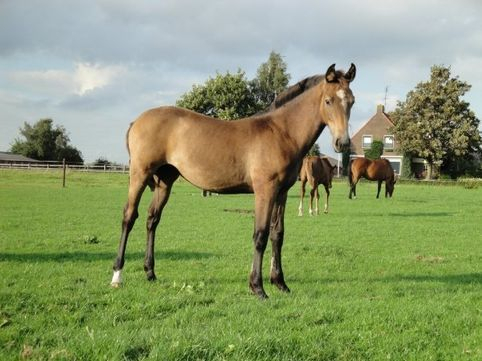 She will also be started undersaddle and bred to Cardento for a 2013 foal. Her photo below shows her fresh from the fields and ready to begin training. Conformation (EXT) 70 Gaits(G) 75 Jump(SPR) 75. Ellamieka is safely in foal to Cardento and due mid-May 2013. This will be the first second-generation foal for Mikali Farms! May 21, 2013: A filly is born!! 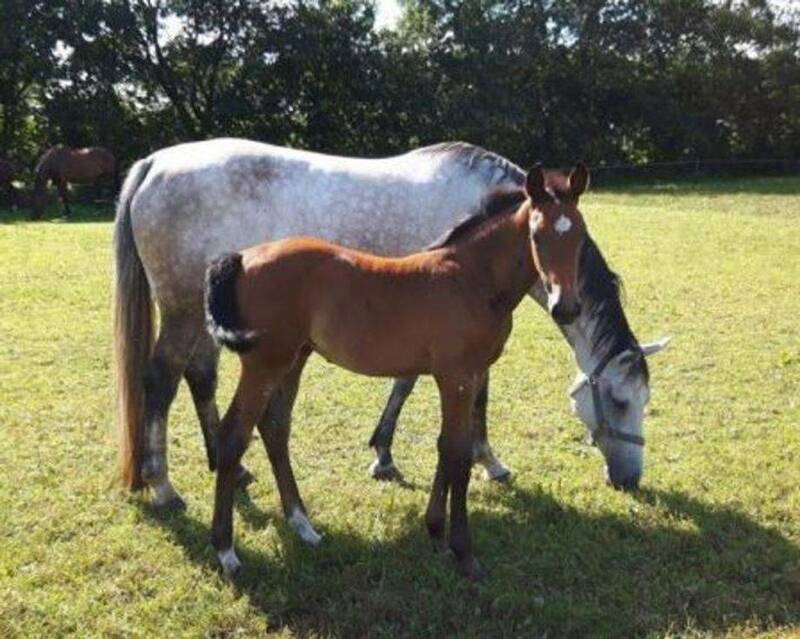 Ella graced us with a very modern, blood type mare with her filly by Cardento. We have decided to name her "Idellamieka". Ella is out in the fields with her daughter "Ida" and the other mares and foals for the rest of the summer. It is always nice to be able to see the horses in person! 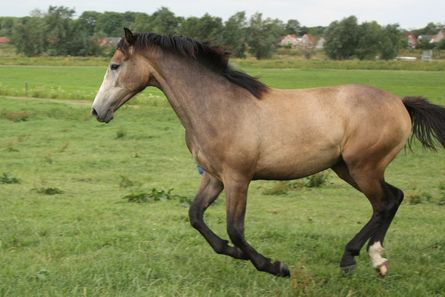 Future plans for "Ella" are to wean her this fall and get her going under saddle so that she may do her IBOP in 2014. 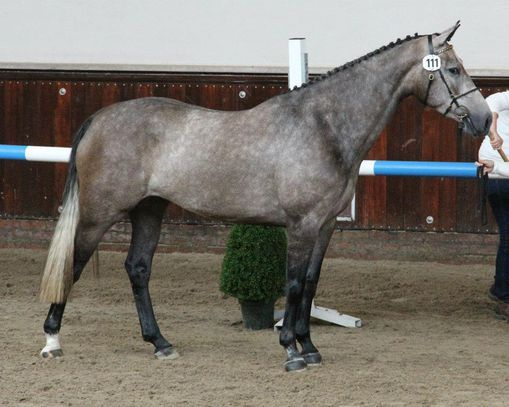 Ellamieka is now at Stal M. de Boer to start her under saddle training in preparation for an IBOP this summer. It is amazing the amount of progress that can occur in just a few short months with the young horses! Ellamieka has gained so much confidence under saddle and it was great to see her bravely tackle the jumps in front of her! Many thanks go out to Julien de Boer and the entire team at Stal M de Boer for bringing Ella along! It is so exciting to see our first foal out in the show ring!! Although she has competed up to the 1.20m level, the decision has been made to breed Ellamieka this year and sell her in foal. With her incredibly strong damline and athletic first filly, we feel she will be of interest to breeder and competitor alike. 2016 UPDATE: Ella had a grey/bay filly by Carrera VDL on June 27, 2016. The new owners have named the filly Lamieka JM. Ellamieka has been sold again - current whereabouts unknown.